Exporting brings a number of risks including foreign buyer nonpayment. Letters of Credit are just one way to mitigate these risks. As a refresher, a Letter of Credit is basically a contract, moderated by a bank, where the foreign buyer gives the payment to their bank, and the bank holds that payments until after the terms and conditions stated in the sales contract have been met. Letters of Credit have normally been the standard for managing these risks; however, other methods of payment have picked up in use when dealing with international transactions. Build safeguards into the letter of credit such as delivery, quality control, etc. Do the costs of generating a Letter of Credit outweigh the benefits of the transaction? Are we exporting to the same buyer in the same country on multiple transactions? Do we have multiple buyers we are exporting to? If you said yes to one or more of these three factors then export credit insurance may be the right fit for you. 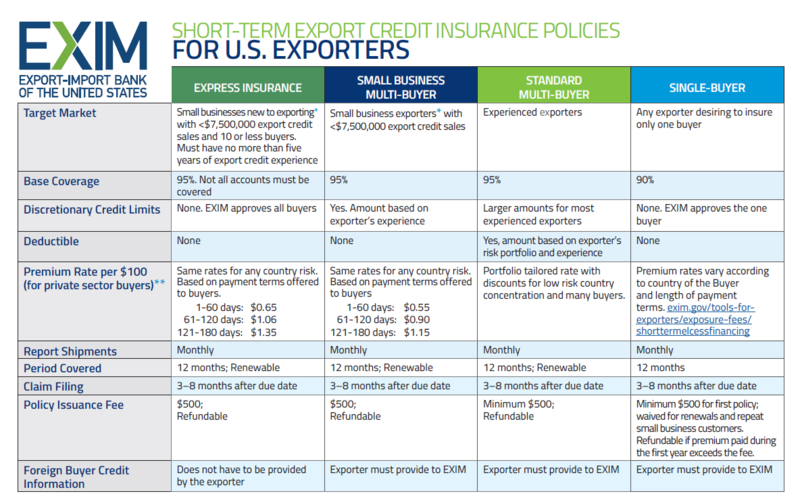 With EXIM export credit insurance there are a variety of options that provide coverage in riskier emerging foreign markets. In fact, EXIM covers export sales to over 175 countries. Transitioning to export credit insurance is as easy as picking up the phone and speaking with a trade finance specialist.